Are Tolkien’s Orcs Really THAT Evil? In the moral universe Tolkien created, good and evil, at least on the surface, appear fairly cut and dry. Races like Hobbits and Men (at least certain types of them) are unequivocally good, while races like Orcs, Trolls, and the lesser types of men are transparently evil. Anyone who has read his work with any level of attention to detail and depth, however, soon realizes that these moral divisions quickly break down; Gollum was in origin a Hobbit, and even many of the much-vaunted Numenoreans fell under the sway and influence of evil. But what of the Orcs, those seemingly utterly dispensable minions of both Morgoth and Sauron that periodically emerge to scourge the rest of Middle-earth’s inhabitants? Can anything even remotely redeeming or laudatory be said of them? I would like to argue that it can. For one thing, we must remember the origins of these terrible creatures. The Silmarillion suggests that the Orcs were once Elves, taken by Morgoth and tortured until they became something utterly alien to their original natures. When one considers the extraordinary physical and spiritual agony these Elves must have endured in order to produce the twisted, baneful creatures that we meet several times in the various tales of Middle-earth, one cannot help but feel at least a pang of sorrow and remorse that creatures as fair and beautiful (if often prideful and stubborn) as the Elves should be turned so thoroughly to evil and destruction. Even though Orcs are cruel and seemingly immoral, hating all things (including, it would seem, themselves), they are not always obedient, nor indeed loyal, to the dark powers that constantly command them (usually through a form of intimidation and the threat of physical violence and pain). Take, for example, the conversation between Shagrat and Gorbag in The Two Towers. It quickly becomes clear that these two Orcs, at least, do not wish to be in service to Sauron, for they broach the subject of one day setting up on their own, out of the control and out of the reach of those who have so consistently dominated them and made their lives a misery. While they will, it is suggested, maintain their Orcish ways, plundering and pillaging those around them, there is something in this particular passage that speaks of a desire to escape from the bonds set about them, that they do not, necessarily, enjoy being evil (though they clearly enjoy the idea of doing evil and violent things). While they are clearly unrepentantly evil, it is not clear that they are, necessarily, irredeemably so. Of course, one cannot ignore the fact that, with a few exceptions, the Orcs are rarely given anything remotely resembling character development. Yet even this, I think, contributes to the reader’s understanding of them as a race victimized and abandoned by those who created them and continues to exploit their labours (which, of course, are not at all appreciated). In one of his letters, Tolkien referred to them as the rank and file (a clear echo of his own experience in the trenches of World War I), suggesting to me at least that he intended the reader to view them with at least something of a sympathetic eye. These are creatures, it seems, whose lives have no value and whose deaths (unlike those of Elves, Men, and Dwarves) receive no marker nor memorial from either their own side nor their enemies. Some of this even bleeds over into Jackson’s adaptation of The Lord of the Rings, particularly in The Fellowship of the Ring. Saruman, the traitor, asks his Uruk-hai henchman Lurtz whether he knows how the Orcs first came into being. He notes that they were taken, tortured and mutilated, and rendered into a ruined and terrible form of life. Indeed, Jackson’s adaptation does an excellent job of showing us the squalour and agony from which the Orcs (or at least this particular breed) are created. Whatever else one can say about the Orcs, these few vignettes do allow us to see that they are more complex than many have them credit for being. All of this, of course, raises significant questions about nature and about just how much sympathy we as readers are supposed to have for the alleged nature of these creatures. I know that I, at least, am moved to at least some measure of…pity?…understanding?…empathy?…I can’t quite decide how to classify my emotions. The Orcs are, in a way, the abject of Tolkien’s universe, the castoff and the refuse that has to exist in order for the moral order to make sense. As with most cases of abjection, however, they evoke a complex and often contradictory range of emotional responses from readers, myself included. But then, it is precisely moral complexity and questions of agency that Tolkien’s work always creates, and that is definitely a good thing. As most of you no doubt already know, Charles Dickens’s A Christmas Carol has been, to put it mildly, one of the most frequently adapted Christmas stories in the history of Christmas stories. Some of these, admittedly, are quite terrible, but there a some that truly stand apart as worthy entries in any Christmas Classics List. One of these, and one of my three favourite versions of the story (the others being Mickey’s Christmas Carol and the version starring the American actor George C. Scott as Ebenezer Scrooge), is The Muppet Christmas Carol. To begin with, the casting is truly exemplary, both in terms of human actors and in terms of their Muppet counterparts. I would not necessarily have pegged Michael Caine as being an ideal choice to play one of the most iconic Christmas characters, but to this day his characterization stands as one of the best. He manages to convey just the right amount of the various emotions that comprise Scrooge as he develops from a man with a heart of flint to a lively spirit who acknowledges and embraces the beauty of humanity. Gonzo and Rizzo, of course, threaten to steal the show, with their witty repartee, but they are also a key part of the film’s optimistic charm. And who else could possibly play Bob Cratchit in this version but the loveable and relatable Kermit? Who, I ask you, doesn’t tear up when he returns from the church to say to his wife that he has found a place on the hill in which to bury Tiny Tim, because he liked to look at the ducks? And that tiny little frog that plays Tiny Tim? I’m tearing up just thinking about it. While this version of the tale is more upbeat than some (it renders the Ghost of Christmas Present as much more of a gentle and jovial giant than the spirit of mingled joy and terror that emerges in other variants of the story), it does have its darker moments. The lead-up to the appearance of the Marley Brothers, for example, is actually quite spooky, as is the appearance of the dementor-like Ghost of Christmas Yet to Come (and it is worth pointing out that this film precedes any entry in the film franchise by quite some time). Even more importantly, however, The Muppet Christmas Carol manages to capture a great deal of the sadness that characterizes Scrooge’s early life and that in large part explains his actions. The brief montage that shows him slowly growing older, each Christmas spent alone, supported by Michael Caine’s pained and anguished expressions, provides us a glimpse into the pain and agony produced by years of crushing loneliness and solitude. How can one not feel sorry for a man who has clearly feels so strongly that he had to invent, as a child, the rationalization that being one provided time for reflection and study? Most poignant, is the scene in which Belle, convinced at last that Scrooge no longer has any place for her in his life, sings the truly heart-breaking song “When Love is Gone.” This song perfectly captures the bone-deep sadness that can only emerge from that most tragic and despairing of words, “almost.” Ebenezer and Belle almost spent their lives together in happiness; they almost found completeness. The fact that this is so clearly in the past, so completely unalterable, imbues the already-melancholy lyrics with an even deeper layer of sadness. When it is over and Belle walks sadly away, we in the audience weep along with Rizzo. (Unfortunately, most newer releases of the film have excised this song, which is unfathomable to me, since it is integral to the plot and to Scrooge’s development as a character). It is only through sadness that we truly come to appreciate the joys of life. All in all, The Muppet Christmas Carol is a film that is remarkably faithful to the original novel, while also possessing charms of its own. While it didn’t make that big of a splash when it originally premiered, it seems to have gained something of a devoted cult following (at least, if my English colleagues and I are any indication). I would definitely advise procuring the earlier DVD release, however, if you want to experience the film as it should be viewed. This post is part of the Battle of the Five Blogs, or six blogs to be precise. 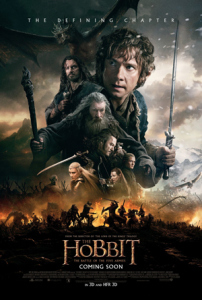 It is a throw-down of various Tolkien bloggers who are thinking about the release of the final installment of Peter Jackson’s Hobbit trilogy, The Hobbit: The Battle of the Five Armies. Other bloggers in this series are Kat Sas, James Moffett, Sørina Higgins, Crystal Hurd, and Matthew Rettino. Follow the links to check out their reviews, recaps, and rants. We encourage comments and links to your own reviews, recaps, and rants. There is a curious thing that happens to C.S. Lewis’ writing: He made friends. We Tolkien fans are, not surprisingly, a very diverse group. There are those of us, for example, who are exclusively fans of Tolkien’s original works (and even then there are further subdivisions, as there are those who only like The Hobbit and The Lord of the Rings but not The Silmarillion). There are those who came to Tolkien and then came to the Jackson films, and then there are those that came in the reverse order. Perhaps no group is as devout, and often as judgmental, as the purists ( my Mother, who introduced me to Tolkien all those years ago, is most definitely one of them). I think most Tolkien purists would agree with the assessment that, for them, Tolkien’s words and vision are, if not perfect, then quite adequate as they are and do not need meddling or changing, even in a film adaptation. The most die-hard among them (the most famous and high-profile being Christopher Tolkien), have even gone so far as to say t Tolkien’s work is, in essence, unfilmable. How could any film, and perhaps any television series, possibly do justice to a world so elaborately and meticulously developed as Middle-eath and a novel so equally developed as Lord of the Rings? For that matter, how to convey so many of the rich and deep themes that Tolkien does explicitly through language? Now, I’ve never aligned myself with the Tolkien purists, though I do recognize the validity of their viewpoint and am sympathetic to the concerns they raise about, for example, the translation of Tolkien’s work into screen (most notably in the films of Peter Jackson). However, as a passionate fan of both film and the written word as Tolkien set it out, I always find myself caught in something of a conundrum, one that I’m sure many people who are fans of novels find themselves in when their beloved text is brought to the screen. However, I do not find myself caught up (as a rule) in the mindset that Tolkien’s vision for his works should be respected at all costs, not least because, as a student of post-structuralism, Foucault, Derrida, Barthes, and the like, I don’t really think that authorial intention is ever fully recoverable nor should it be the only way that we read or take pleasure from a text. Again, this is not to devalue that particular way of reading (and, indeed, I think with Tolkien it can be very productive to think through the author-centric perspective), but that shouldn’t, in my view, be the only, or even the dominant, aesthetic criteria by which to judge Jackson, or any other filmmaker’s, interpretation of it. (Also, if I read one more reviewer or commenter who says that Jackson thinks he’s a better storyteller than Tolkien I think I shall scream). Part of my coping mechanism has been, I think, to recognize that Jackson is a fan, and that as a result he has a particular vision of Tolkien’s work that he would like the rest of the world to see and enjoy. This isn’t necessarily to excuse all of the decisions that he has made, particularly when it comes to the recent Hobbit films (though, as I have said elsewhere, I think they are truer to Tolkien’s vision than a lot of people give them credit for being). After all, I still cannot quite wrap my head around the idea of the were-worms, even though it’s pretty thoroughly proven that they are, tangentially, canonical. However, thinking of Jackson as a fan, and thinking of any work of adaptation, as a fan text can, I think, allow us as Tolkien fans to begin to find other ways of taking pleasure in and enjoying these texts. I also remind myself that Jackson, like myself and countless others, particularly those who write fan fiction, has a stake in this vision, which helps me from becoming too irate at the changes he has made. Remaining wed to a purist point of view, for me at least, proves more crippling than enabling. Spending the entirety of a Jackson film nitpicking and teasing out every single change can provide pleasure, it is true, but for me it ultimately proves tedious and spoils the pleasure of the visual. There are, I think, much more compelling ways of talking about the changes required from page to screen, as well as the motivations (both of the filmmaker and others) that motivate such changes. It also, I would argue, helps us to think more complexly about the ways in which Tolkien’s works change and become ever more enmeshed in the world around them. I suppose the most compelling reason that I am not a Tolkien purist is my belief that, no matter how many changes are made to Tolkien’s works as they are adapted to different media (and I know I’m not the only one holding out for a TV serial drama to be made at some point in the not-too-different future), the original works, complete with all of the other commentary that both J.R.R. and Christopher, and countless others, have provided, are still waiting for me, resting at their ease on my bookshelf. On its most basic level, Nightcrawler (Dan Gilroy, 2014) is a heavy-handed satire that indicts the “if it bleeds, it leads” mentality and the normalization of violent and gruesome images on television news. Since images of the Vietnam War made their way into people’s homes via television screens, there have been debates about how much is too much, and what one can and cannot show, ethically, on television. However, Nightcrawler also contains a much more interesting satirical thread in the figure of its ruthless entrepreneur Lou Bloom,* played by Jake Gyllenhaal, a young man who films accident and crime scenes and sells the footage to the news. The film satirizes the discourse of bootstrapping and “job-creating” entrepreneurism that rose (from its continual background presence) to particular visibility during the 2012 presidential campaign. Enjoyable epic fare, but not as compelling as it could have been. This was supposed to be the year of the biblical epic, the triumphant box office return of a genre that has become quite unfashionable. * First there was the much-hyped Noah, and now we have Ridley Scott’s latest epic adventure, a re-telling of the Moses story, this time with Christian Bale as the Old Testament patriarch and Joel Edgerton as the petulant and ultimately defeated Pharaoh Rameses. If the lackluster domestic box office of Noah and of Exodus so far is any indication, it may just be the case that the epic is no longer the genre of choice for the conveying of Biblical themes and stories. Some of this can be laid at the feet of the film itself. While Exodus contains all of the pieces that typically make these types of epic films such fun to watch–including some truly cringe-worthy acting at points–somehow they didn’t quite gel for me as a viewer. It’s not that I didn’t like this film; I actually enjoyed it quite a lot. It’s just that it didn’t quite hit all of the right notes that I had been expecting, and it distinctly lacked a strong emotional core that typically allows these films to transcend their tawdriness and evoke something deeper. What makes Ben-Hur such a success, I would argue, is both the emotional and physical complexity invoked by the relationship between Messala and Ben-Hur, as well as the anguish his mother and sister endure as a result of both their leprosy and their self-enforced exile. Likewise, what makes Gladiator succeed as an epic is the emotions that it manages to wring from us; despite myself and my ever-critical eye, I always find myself tearing up at the end, when Maximus dies on the sands of the arena. Those moments, problematic as they are, gesture toward the emotional truths that the film’s seek to convey, and while all epics try to do this, only the truly great ones succeed in all the right ways. Alas, Exodus does not seem like it is going to be one of those. Part of that, I suspect, has to do with the cloud of well-deserved controversy after it was revealed that none of the male leads (with the exception of Ben Kingsley) was going to be in any way a person of colour, a situation made infinitely worse by Scott’s tone-deaf response to accusations of whitewashing. However, it also has to do with the actors he has chosen to cast, as well as his (mis)use and wasting of certain talents. As numerous reviews have noted, Sigourney Weaver is utterly wasted as Tuya, and I am going to go on record as saying that Joel Edgerton is a rather pathetic and simpering representation of Rameses, arguably one of the most influential and politically and militarily successful pharaohs produced by Ancient Egypt. Edgerton transforms him into something pathetic and ineffectual, and there is a bit near the beginning of the film where he handles albino snakes that is so obvious in its connotations as to be hardly worth mentioning (Scott is not always known for his subtlety). I cannot help but compare him unfavourably to Yul Brynner, who was able to inject Rameses with the right amount of inflexibility and strength. Bale, likewise, seems miscast as Moses, but this may be less a result of his acting than of the oddities of the script. After my initial viewing, I’m still rather unclear about what exactly motivates Moses to go back to Egypt after his sojourn in the desert. There is simply too little exposition (amazingly, considering the genre), and too little characterization of either Moses or God (who appears as a disturbingly precocious young boy), for the actions of the characters to make sense. Bale doesn’t help matters; though he may have more emotional range than a Charlton Heston (who, in some ways, may have been better cast as one of the largest and most imposing of the Old Testament patriarchs), he still seems rather lost in the rather senseless plot. In many ways, Exodus feels like a bit of a re-tread of Gladiator, except with soaring visuals of Egypt and desert landscapes rather than towering vistas of a digitally-rendered Colosseum. The conflict between two “brothers” over the love of a woefully ineffectual father ultimately powerless to change the inheritance laws of his own country, the parricide of one brother (it is strongly hinted in Exodus that Rameses is responsible for his father’s death, given his propensity for milking venomous snakes for their poison), is a bit too trite and overdone. Luckily, Scott doesn’t flail that dead horse too much, but then he largely eschews human magic in many of the relationships. Even those that should be emotionally resonant, such as that between Zipporah and Moses, felt curiously empty, as if they were an afterthought. There were some genuinely compelling and interesting moments in the film, such as when it becomes obvious that Rameses is fudging the historical record in order to render himself braver. One might wonder why so many representations of this particular story seem intent on painting Rameses as either a coward or a military incompetent, largely as a means of building up Moses’ own abilities (this happens in The Ten Commandments as well). More importantly, as I mentioned earlier, there are some truly brilliant shots of various landscapes, and that alone made it worth the ticket price, since you really do need to see those shots on the big screen to get the full effect of seeing the tininess of the human form set against the vastness of the natural world. Likewise, the plagues were rendered with a visual flourish that show the capabilities of CGI and Scott’s use of it. Indeed, they were in many ways the visual and narrative core of the film, and he way in which they were portrayed helped capture, for me at least, the experience of visceral terror that those who encountered them in the flesh must have experienced. And, since they all (with the exception of the killing of the firstborn) afflict the Hebrews as much as the Egyptians, this sequence also draws attention to the essentially violent and vengeful nature of the God of the Old Testament, something that is often ignored or forgotten. All in all, this was a compelling film. However, I very much fear that, as was the case with Noah, the film doesn’t do anything well enough to charm any of its possible audiences. It is not faithful or devout enough to appeal to Christians, nor is it coherent enough to really appeal to those who love the epic. Perhaps more than anything else, however, its lack of success may be due to the fact that the historical epic as a genre may not have the explanatory power it once did. Or maybe they just aren’t being made correctly. Perhaps time will tell. Peter Jackson has taken a lot of flack for the alleged butchering of The Hobbit, variously described as bloated, silly, crass, and all of the familiar insults typically hurled at his work, and at fantasy in particular. Most frustrating, and revealing, however, has been the consistent charge that Jackson has caved in to his own fan-boy impulses, importing many subsidiary plots into the main narrative of his new trilogy of films. Indeed, Laurence Dodds of The Telegrapg even went so far as to say that, in essence, “This [Jackson’s film trilogy] is typical nerdism, which cannot imagine an imaginative gap which does not exist to be filled.” Nor is Dodds the only one to argue that Jackson has done something awful to Tolkien’s legacy, for no less a luminary than Christopher Tolkien, J.R.R.’s literary executor, argued in an interview with the French periodical that Jackson has turned his father’s work into banal entertainment designed to entertain 15-25 year-olds (it hardly bears noting that it is precisely that age group that originally gravitated to Tolkien and has also consistently kept his works in print). What emerges from both of these critics is a sense that it is precisely the fans of Tolkien’s work that have done the most “damage” to his literary legacy (I referenced this point in my post about the vexed question of Tolkien ownership). Of course, it should be no surprise that the literary establishment, the intelligentsia, and film critics should fall into such frankly lazy ways of dismissing the work of Jackson’s. Indeed, the terms they use to dismiss his work are eerily similar to those the established critics used to dismiss Tolkien’s works when they were originally published. And, borrowing from Tom Shippey’s impassioned and well-articulated defense of Tolkien, I would argue that these folk do not know how to read Jackson and that this, more than the failings on Jackson’s part, lie at the heart of their stalwart and stubborn (and often quite vicious) unwillingness to grant him any appreciation or critical approbation. Again and again, the reviews keep saying that Jackson did something wrong (and downright avaricious) by pulling in the backstory to The Hobbit that was only revealed in the Appendices to The Lord of the Rings. But, you know what? I’m actually glad that Jackson has fleshed out his version of The Hobbit. I know that I am not the only Tolkien/Jackson fan that was looking forward to the epic battle between the White Council and the Necromancer. Was every part of that confrontation as I would have wanted it? Of course not. I wasn’t the filmmaker, and so my vision doesn’t always mesh with Jackson’s. That doesn’t lessen my enjoyment of seeing this background brought in, however, for it deepens and enriches our understanding and appreciation of The Hobbit. The films allow us to understand many of the unseen processes at work even in the novel, and while this may not be to everyone’s liking, as a self-professed Tolkien nerd I highly enjoyed it. Through it all, and through everything, I have been struck by the emotional truths that these films reveal. As I noted in my review of the film, I think that The Battle of the Five Armies hits the closest to the spirit of the North that The Hobbit gestures toward (albeit obliquely). There is a sense throughout this film of loss and of sorrow, of fighting even though the effort seems vain. As with The Lord of the Rings (both novel and film), The Hobbit (novel and film) suggest that, with every battle we fight, we cannot remain unchanged or unscathed. We are changed, and there will inevitably be sorrow, and sometimes even regret, at what has been lost. Sorrow and regret suffuse Tolkien’s entire ouvre, I think, and the marker of Jackson’s success as a filmmaker has consistently been his ability to capture that sensibility, glimpsed most powerfully in BotFA in the final scenes, as Bilbo returns to his home and, when asked who was his employer, responds, “My friend.” Shortly afterward, as he stands in his ransacked house, he makes to put on the Ring and we, in the audience, know that he has indeed been forever changed by the actions of his quest, that there is no going back. The simplicity of these scenes, the sparseness of the dialogue, and the raw yet subtle emotion conveyed by Freeman’s Bilbo, all combine to engender in the viewer a profound sense of sadness and loss, a profound sense of emotion that grants meaning to the entire film that preceded it. Likewise, I have always thought there was a genuineness to Jackson’s endeavours. He did not want, originally, to do The Hobbit film adaptation. And who could blame him? The critical and fan reactions to George Lucas’s similar attempt to flesh out the back story of his famous film trilogy must have been uppermost in his mind, and I’m sure he wanted to avoid inviting the same kind of venom. Sure, there is quite a lot of bombast in this last film, but who can blame Jackson for having a bit of visual fun with this last visit to Middle-earth? And sure, some of it may be a trifle overdone (I still can’t wrap my head around the giant sandworms), but that last scene, and several more, really make all of the CGI worthwhile. It is these moments, such as the fraught parting of Thranduil and Legolas, or the emotionally resonant one between Thranduil and Tauriel, that show that, for all of the bombast, at heart Jackson loves this world and the stories contained in it. All that he has done, he has done for love, for Tolkien and for the fans who have stood by him through all of his endeavours. And as for those charges that he has somehow “ruined” Tolkien’s work or vision or whatever other idiotic expression the critic chooses to use, I would simply say this. Tolkien’s original version of The Hobbit still exists, is still widely available, and is still in print. If you prefer the (deceivingly) simple whimsy of that version of the story, by all means continue reading it. I know I do. But that doesn’t mean that Jackson’s version is complete rubbish, nor does it give anyone the right to dismiss (often in quite cruel and simplistic terms) the nerds and fans who have not only made Tolkien’s work the cultural phenomenon it is, but have also dedicated substantial portions of their lives, and some cases their academic careers, to enriching their lives and those of others by finding new ways to appreciate Tolkien’s work. Many of those same fans–but by not means all–have also done the same for Jackson, and I count myself fortunate to be one of them. In closing, I would refer once again to Tom Shippey (still, to my mind, the authority on Tolkien), who argued some time ago that Jackson has provided one road to Middle-earth, though hardly the only one. I know that I, whatever others may think, have been quite happy to go with Jackson down that road. The final installment of Jackson’s Hobbit trilogy hits many of the high, operatic moments of The Lord of the Rings, leaving this fan completely satisfied, and more than a little sad, at this concluding cinematic adventure in Middle-earth. Further warning: I will probably also have more thoughts on this film after I see it a few more times. When I first watched The Hobbit: An Unexpected Journey, I knew the film was worthwhile when, very near the end, Bilbo announces to the Dwarves that he came back to help them because he wants them to have the same feeling of home that he does. There is something so intensely emotional and genuine about that scene, something that hits an emotional truth, that renders the entire preceding film both legible and compelling. A similar scene occurs in the second film, surprisingly enough when Kili, having just recovered from his wound, asks, “Do you think she could have loved me?” Again, this made the entire film worthwhile for me, reaching into and beyond the more hyperbolic elements of the film. The Battle of the Five Armies, fortunately, has many of these moments, starting from, surprisingly enough, Smaug’s death. For all that he is one of the primary villains of the franchise, seeing his agonized death-throes proved, for me at least, to be a profoundly moving experience, as we literally watch the light fade from his eyes before he plunges in ruin into the already-burning Esgaroth (killing the avaricious Master in the process). The duel between the White Council and the Necromancer likewise packs quite the visual punch, and we finally get to see Galadriel unleash the full extent of her power. Admittedly, this scene did not take up as much time as it could have, and that actually proved an advantage, as it was tight, focused, and emotionally resonant. Of course, we have known from the beginning of these films that the Necromancer will merely flee to the East and take shape as Sauron indeed, but that doesn’t lessen the visual impact of this scene. What’s more, Christopher Lee shines (as always) as Saruman, and his ominous line “Leave Sauron to me” leaves us in no doubt that this is the beginning of his slide into the service of the Dark Lord. Lee’s is just one performance among many that, I think, help to grant this blockbuster film its emotional core. It goes without saying that Ian McKellan hits all of the right notes as Gandalf (I think he could do this role in his sleep and still manage to be compelling), but even more recognition should go to Richard Armitage and Lee Pace, both of whom manage to bring an enormous and riveting depth to their characters. Indeed, I would even go so far as to say that they, perhaps more than any other actors to appear in Jackson’s visions of Middle-earth, come closest to the ancient heroes of the North that Tolkien so admired. We admire these characters for their bravery and their ability to face their dooms, even as we also shake our heads at behaviour our modern mindsets do not allow us to fully understand. It is this dance between different identifications and emotions, I think, that allows us to find characters as potentially unlikable as Thranduil and Thorin so infinitely compelling and their fates so intensely sad. Who did not weep at the parting of Thanduil and Legolas, for who can say whether they will ever join one another again? And who did not feel a bone-deep sorrow for the death of Thorin, a flawed yet heroic figure, enshrined and honoured by Bilbo’s title of “friend”? There were other moments of genuine emotionality. The deaths of Fili and Kili, while expected, hit me harder than I thought they would; it is a testament to Jackson’s ability as a filmmaker that he can shuttle so effortlessly between bombast (and there is quite a lot of that in this film) and these intimate moments of intense feeling. Indeed, Jackson actually does quite a good job of showing the actual human effects of war, rather than leaving them in the abstract. Equally affecting was Bilbo’s genuine invitation to his Dwarvish companions to join him for tea at any time, without needing to knock. Freeman manages once again to bring a full range of emotions to the character of Bilbo, and one can actually believe his tears when he finally breaks down at Thorin’s deathbed. There were a few things that did not quite hit the right notes, such as the eagles dropping Beorn into the middle of the battle, as well as Radagast riding said eagles. There were also mysterious worms that look like they could have come out of the Dune universe. Still, it’s clear that Jackson was having fun in making this film, and I for one appreciate the fact that he catered to what he thought the fans wanted to see. Say what you will about Jackson, but there has never been a doubt in my mind that he loves Tolkien and he loves the fans. All in all, this was in all ways the perfect way to say goodbye to Jackson’s vision of Middle-earth. Naturally, I cannot wait to see the Extended Edition, since it’s quite clear from the very slim running time (coming in at under 2.5 hours) that Jackson was under some pressure to make a shorter film. Nevertheless, he still manages to capture the intense tragedy that lies just beneath the surface of The Hobbit. This is the beginning of the end of this age of larger-than-life heroes such as Thorin, Thranduil, and Gandalf, and their like will never be seen again. As I said goodbye to Middle-earth tonight, Tauriel’s last conversation with Thranduil resonated most powerfully. As she weeps over the body of Kili, she begs her king to take her pain away, asking mournfully, “Why does it hurt so much?” And he replies, with a world of sadness in his own voice, “Because it was real.” As I savour the sweet hurt of saying goodbye to Jackson’s Middle-earth, I can’t help but be grateful that it, too, was real. This maxim has largely been true of both my academic and my fiction writing. Once you’ve reached that word goal, you can consider your job largely done. The downside to this productivity model is that it can sometimes (often) be difficult to shift mental gears and get into revising mode. Indeed, for me at least, the shift into revision very often feels less straightforwardly productive than producing words on the page. As a result, I sometimes find that I get trapped in a cycle where I’m just producing endless reams of words, many of which won’t even make it to the final cut of whatever I happen to be working on. Now, that’s not to say that there isn’t a great deal of value to be found in this sort of goal-driven mentality. However, there is also something to be said about the importance of reflection and revision, the former before the writing takes place, the latter afterward. There is something uniquely rewarding about both of these aspects of writing, as you allow ideas to gel somewhat in your mind before setting pen to paper (or fingers to keyboard) and give yourself the time to really attack your writing with a critical eye (as difficult and sometimes painful as that is). And nothing compares to the feeling of trimming out the excess words that inevitably creep in, especially when you are always focused on producing more words (as painful as it may be to let go of those little representatives of productivity). Tolkien, as many readers of this blog no doubt already knew, was a very deliberate sort of writer, often revising a draft many times over the course of its composition. Indeed, the entire mythos that he developed was spawned during World War I but would be continually revised and expanded right up until the last years of his life. Tolkien understood (I believe) the necessity of letting ideas mature before settling into a final form, and what some may interpret as vacillation I interpret instead as a willingness to engage with the fundamental changes that occur in any work, whether fiction or nonfiction. This really came home to me last year, when I began the long journey of reading the numerous volumes of The History of Middle-earth (compiled by J.R.R.’s son Christopher). Reading the volumes around The Lord of the Rings in particular, I began to get a sense not only of how Tolkien’s vision changed, but how he would also hold onto certain things, especially names, long after the point where it became clear that they were not longer practical. As you read through these volumes, you definitely get a sense that Tolkien was, in his own terms, a niggler, always fussing and tweaking even the tiniest and most mundane of details (he would even write a thinly-veiled version of himself in the quirky and quaint Leaf by Niggle). And that, I think, is one of the most fundamental and important lessons that I’ve learned about writing from one of the masters of the craft. It’s okay to have a set idea of what you want to get out of a piece of writing, and sometimes it’s okay to even sketch out an online of the entire project. However, I also think (as Tolkien seems to have), that it’s also okay (and sometimes preferable) to have a more freeform approach, allowing the ideas to sort of sprawl all over the place before you corral them into some semblance of coherence and meaning. Sometimes, it’s okay to not quite know where you are going with a short story, a novel, or even a dissertation, until you actually discover your destination in the midst of writing. In other words, Tolkien helped me to discover the joy of discovery in writing. And that, I think, is a valuable lesson for all of us who enjoy the act of composition, whether we be academics, creative writers, or some unsettled combination of the two. It’s hard now to remember a day when Peter Jackson’s films (whatever one may think of them) were not the dominant, go-to examples of Tolkien on film. Growing up in the 1990s, however, I clearly remember a time when, if you wanted to see Tolkien on screen, you had to go to either Rankin/Bass’s productions of The Hobbit and The Return of the King, or Ralph Bakshi’s ill-titled effort The Lord of the Rings. While the Rankin/Bass versions have, with some justification, gone down in Tolkien history as horrible travesties, I want to reconsider them for a moment, to see if there is anything redeeming about them, especially for those who (like me) enjoy and love Jackson, but find some of his artistic choices questionable. To begin with, I want to acknowledge some of the things that people most commonly complain about the Rankin/Bass The Hobbit and The Return of the King. Their particular style of animation is not to everyone’s liking, and it works better in some films than others (it adds a peculiarly sad and exquisite beauty to The Last Unicorn, for example). The artistic offenses are more egregious in The Hobbit, not only in the design of Bilbo (who comes out looking more like a frog than anything that anyone would identify as a hobbit), but also in Thranduil, who is rendered as some sort of purple, gnomish figure. The Return of the King is little better, and I still cannot determine why most of the Nazgul ride winged horses, while the Witch-king gets to ride the fell beast (though, strangely enough, Jackson’s film also features an inaccuracy in that, in the novel, during most of the battle and the siege the Witch-king actually rides a normal horse; he does not mount the fell beast until he is thwarted at the gate by Gandalf and the arrival of the Riders of Rohan. In Jackson’s version he is on the fell beast throughout). The music is, for the most part, far too saccharine to be effective or truly emotionally moving, and it is the clearest sign that these films were largely intended for a child audience. The one exception to this would have to be “Where There’s a Whip There’s a Way” from The Return of the King, which is almost infectiously catchy. However, even it seems somewhat at odds with the tone of the moment, considering that Sam and Frodo are trying to find their way across the plan in Gorgoroth to in order to destroy the Ring (I would also point out the continuous mispronunciation of Sauron, here pronounced Sore-on). However, there are some redeeming qualities, and I actually think that the Rankin/Bass films do some things better than their Jackson equivalents. For one thing, however else they butcher the plotlines, Rankin/Bass often keep some of the more archaic-sounding pieces of dialogue from the original. Smaug’s delivery of his lines in The Hobbit is, I think, in some ways superior to that of Jackson (and this is the fault of the writing more than Cumberbatch, whose voice is, as always, pitch perfect), and the confrontation between the Witch-king and Eowyen in The Return of the King actually maintains the rhythms of Tolkien’s original words. They keep, for example, the cadence of “No living man can hinder me” (Tolkien’s phrasing), which Jackson changes (and dare I say banalizes) to “No man can kill me.” Admittedly, however, the voice of Jackson’s Witch-king is much more compelling than the high, reedy one of Rankin/Bass, full of a deep-throated, raspy menace. And yes, there are many other voices in these films that rival those found in Jackson’s versions. While Ian McKellan is a truly masterful Gandalf and will probably find no equal in our lifetime, it’s worth noting that no less a Hollywood great than John Huston provided his voice for both The Hobbit and The Return of the King. Roddy McDowell makes an unlikely yet compelling Samwise, and Orson Bean does manage to capture, I think, the world-weary tenderness of Frodo. Of course, no discussion of voice acting in these films would be complete without mentioning the inimitable Hans Conried, whose inevitably and consistently sarcastic, yet also slightly pretentious, voice lends Thorin a certain measure of both gravitas and ridiculousness (which is how Tolkien himself portrayed him). While by no means perfect, the two Tolkien films produced by Rankin/Bass do at least deserve a measure of respect from we latter-day Jackson fans. While they do not capture the operatic and epic grandeur of Jackson’s collection, they do nevertheless capture some of the elements closest to Tolkien’s heart, the archaic cadences of his language. Perhaps more than anything else, there is, it seems to me, a genuineness in this effort that deserves our respect, even if the effort does not universally pay off as we might wish.